After just over a year of reconstruction works the Kop Sud was inaugurated on Saturday. 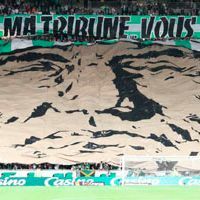 Stade Geoffroy-Guichard is growing and supporters once again prepared a special show for the opening, according to info-stades.fr. In mid-September last year supporters from Kop Nord celebrated reopening of their stand after reconstruction. At the same time dismantling of the south one's roof began. Now the latter stand is almost ready with new cover and an upper balcony. Altogether it can hold up to 10,145 people, of whom 7,817 are standing on the lower terrace. This allowed Stade Geoffroy-Guichard to grow in terms of capacity from 35,616 to 38,576. Opening of Kop Sud took place on Saturday, during the Bastia league tie. Supporters occupying this section prepared a large display showing Indian chief, their symbol for years. The flag was accompanied by slogan saying “Vous avez changé ma tribune, vous ne changerez jamais ma tribu” or, in English, “You changed my tribune, but you won't change my tribe”. After the flag was hidden again, flares filled the stand with light and smoke. Interestingly, info-stades.fr informs about the league authorities (LFP) attempting to remove any clips showing the pyrotechnics display inside. We managed to find a clip, thankfully, which you can see below. As supporters celebrate their return to Kop Sud, work goes on at Stade Geofroy-Guichard. New facades, corner sections and inner infrastructure still needs to be made, along with changes at the main grandstand. Overall, for Euro 2016, capacity of the stadium is to reach some 42,000.